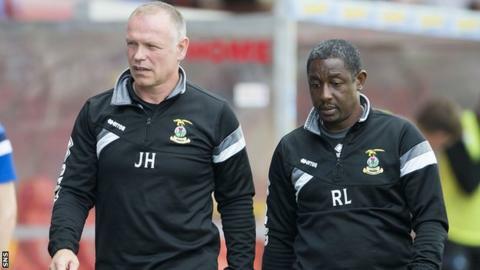 Inverness manager John Hughes says he is relishing Tuesday night's trip to face Rangers on League Cup duty. The Highlanders' unbeaten league run ended at Firhill on Saturday with Partick Thistle coming back to beat them 3-1. And Hughes is already looking ahead to his side's date with Championship side Rangers. "Hopefully it will be a right good atmosphere and a cracking match," Hughes told BBC Scotland. Rangers go into the match fresh from a 4-0 triumph over Raith Rovers on Friday night. "I'm looking forward to it, I've not seen Coisty [Rangers manager Ally McCoist] and the boys for ages," Hughes added. "I believe Glasgow Rangers belong in the top flight. Them and Celtic carry the flag for Scottish football, so it's great to get them in the cup at Ibrox. "They're favourites. Did you see them last night? They were different class." Hughes' troops took the lead at Firhill through Aaron Doran, but Steven Lawless levelled, Abdul Osman made it 2-1 and Kallum Higginbotham's brilliant strike wrapped up the scoring. The game marked Inverness' first league defeat this term and Lawless' goal was the first they had conceded in the league. "You have to give Partick Thistle credit," Hughes said. "They showed great desire to go and win the match, especially in the second half, but they had something to hang on to. "In the first half, we took the lead and I thought there was chances there to go and score more goals. "Billy [McKay] was unlucky a few times, Gary Warren with a header, Marley [Watkins] with a strike at the goalie. "Second half, the whole style of the game changes, Partick could sit in and hit us on the counter attack and, all credit to them, they did that. They scored a wonderful third goal - even I applauded that. "Have I seen us better? Yes. Have we passed the ball better? Yes. Have we carried a bit of luck? Not today. "You'll never get me having a go at these boys as they have been absolutely brilliant since I came in. "We need to put that behind us and let's go and try to improve."